Recently I've been working on a remake of one of my favorite maps of this genre. "Halo 2" Warlock. In addition to worshiping the map, I decided to make a remake because it can also help attract new players to UT4, halo fans. I will continue to work on the map, there is still much to be done, but I thank you for any criticism. Wow, I forgot about this one from Halo 2. I think it was a DLC map, right? You did a great job recreating it! One thing that stands out to me is the scale, the players look pretty big relative to their surroundings. The scale may be similar to the Halo map but the speed and overall pace of UT is much faster. If you agree or just want to experiment, take a look at the MapScaler blueprint (https://www.epicgames.com/unrealtour...ueprint-editor) for a quick and easy way to scale the entire map. Regardless it looks great so far. I can't wait to try it! Actually I was also feeling this, that the scale should be bigger. But when I noticed it was already very advanced and since I was thinking about the map just for duel it might work well. But I'll see this Blueprint seems to be really useful and practical. A nice looking remake you've posted here Snake Patriot! 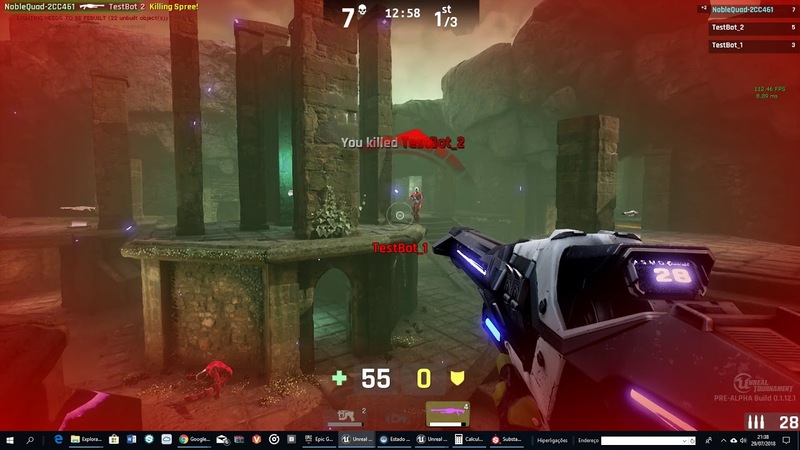 I agree with tidu about the scale being abit tight and maybe consider placing the weapon pickup in the center of the platform instead of next to the pillars. We hope to be able to play on it someday, keep Up the GoodWorks! Thanks. I'm sure I'll follow your suggestions. However I'll also create a server to test the map, I'm still figuring out how I do it. But it does not work with my map, just with some maps included in the game. I do not know what I'm doing wrong ... But in LAN it's ok.
Love it! Loved Warlock in the H2 days and I'm sure I'll love this version! I also agree that the scale should be set a bit higher, but overall, beautiful mesh work! Looks good Snake, be nice to try it out sometime. Visuals are great. It looks detailed without being too busy and it's exactly what this game needs. Good work! There is a post process effect (possibly Saturation) that applies to everything, including players. It's most obvious on the shock core explosions. Not a problem but it looks strange and most players will notice. I'm not sure if you tried that MapScaler blueprint or not, but the map is still very small and difficult to maneuver in some places. The areas that you have to use the jumppad to get to are very small. I'd recommend giving the player some more space up there. In fact it feels smaller than the original Halo 2 map. Try to differentiate the 4 corners of the map. They look nearly identical so it is hard for the player to orient themselves. Maybe add (tasteful) colored lights or decals in each corner, like the original. Or make the sunlight more distinct so the player can use the position of the sun to orient themselves. Some playerstarts point into a wall, rather than the hallway. There are too many shock rifles, for a map this small I would limit all weapons to 1 each. Each duplicate base acts as an ammo refill and can be overpowering. The flak is very powerful on this map. I would remove the 2 flaks, put 1 flak in the center room. Then 1 each of shock, link, mini and bio around the map. Again you did a great job! I think you can still make some small tweaks and still be true to the original map. In fact I just looked up a video from Halo 2 and wow that game looks terrible today. Regarding the map scaler I tried but crash my editor. I'll try again but I'm afraid. In relation to the rest I will see more carefully but it seems easy to arrange. Thank you for putting your works up Snake Patriot! Loaded onto the LoPing Arena for your enjoyment.